Play your iTunes library and keep your iPod or iPhone charged via the built-in dock. Use the audio-in to easily connect additional music sources such as your PC or MP3 player. You can also listen to your favorite CDs or dial in your favorite AM/FM programming. 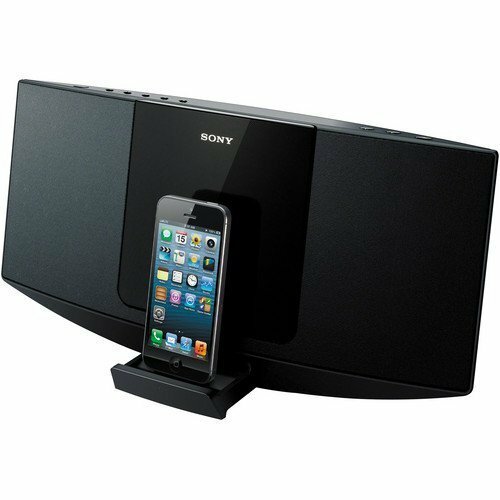 Extra features include a built-in alarm clock, and remote control to navigate your iPhone and iPod playlists as well as other basic stereo functions. Allows you to listen to your iPod by using the built-in dock. Also charges the iPod as it plays. Allows you to listen to your iPhone's music by using the built-in dock. Also charges the iPhone while docked. Enjoy your favorite CDs, and consumer-recorded CD-R and CD-RW discs. Also plays back MP3 files that have been recorded to CD-R/RW discs.